Hospitals make people feel well, but do they make them feel welcome? Now more than ever, you want your hospital to be known as a warm and comfortable place where people are treated by people who care. The most effective way to make that impression is through a hospital blog. Blogging is simply the best way today to connect with people, boost staff morale, and make your facility seem more friendly. It may take a little more time and effort, but a blog can bring you benefits that other branding efforts can’t match. 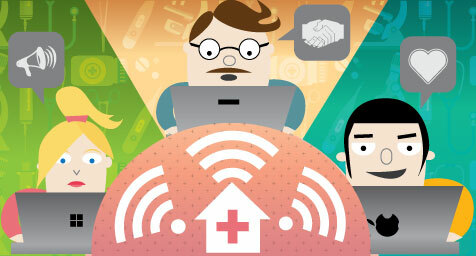 To see why blogging can be so good for your hospital, HealthcareCommunication.com featured these four vital signs. 1. A Hospital Blog Builds Bonds ­– Blogging can lead to loyal relationships with people in your community. When you share interesting news and views, you keep people reading, responding, and returning for more. Just keep your posts short and simple, and use a friendly and casual tone. This helps readers relate to your posts and think of your blog as a source of support. And make your blog easy to follow by offering an RSS feed. 2. Blogging Puts a Friendly Face on Your Hospital – For many, hospitals have an institutional image, but a blog can make your hospital come across as much more human. It adds a personal touch to your hospital branding and advertising and gives readers a sense of comfort. 3. A Blog Shows You Care About the Community – Think of your blog as a virtual voice for professionals, patients, and people in your community. Try to bring in a team of bloggers with a wide range of professional experience and personal experiences. These can include nurses, dietitians, donors, patients, survivors, and hospital executives. Use their posts to share how much you care. 4. Blogging Revives Your Rankings – A hospital blog can breathe new life into your Google rankings. Google favors sites that continually feature fresh content. And that’s exactly what blogging enables you to do. Just make sure to update the blog on a regular basis to maintain your rankings and readership. While a hospital blog needs to nurtured, it’s an operation that’s worth performing for the healthy connection it forms and fosters. Help your healthcare branding do well. Contact MDG Advertising today at 561-338-7797 or visit mdgadvertising.com. MDG Advertising, a full-service advertising agency with offices in Boca Raton and New York, NY, is one of Florida’s top healthcare marketing and branding firms, whose clients include Dental Care Alliance, HCA East Florida, MDVIP, Max Planck Florida Institute, Primary Pharmaceuticals, and the biostation. MDG’s 360° approach uses just the right mix of advertising media to reach your branding goals, where traditional, digital, and social media marketing efforts support each other and your message is tailored to the medium. Learn more about the latest trends in healthcare marketing by contacting MDG Advertising today at 561-338-7797 or visit mdgadvertising.com.